Author Kevin Missal is coming up with the sequel to the popular book “Dharmayoddha Kalki: Avatar of Vishnu” and I have the cover to this exciting release for you right here. Tada!!! Whenever there is a decline in righteousness and an upsurge in unrighteousness, at that time, I take birth again. Born in the quiet village of Shambala, Kalki Hari, son of Vishnuyath and Sumati, has no idea about his heritage until he is pitted against tragedies and battles. Whisked into the province of Keekatpur, which is under the fist of Lord Kali, Kalki sees the ignominy of death trumping life all around him. 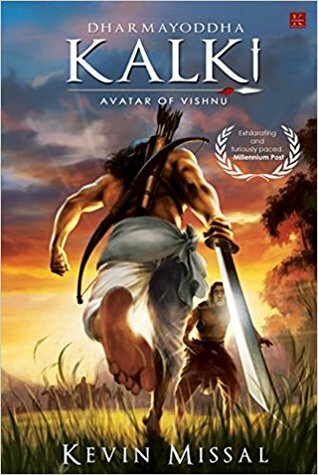 He learns that he has been born to cleanse the world he lives in, for which he must journey to the North and learn the ways of Lord Vishnu’s Avatar; from an immortal who wields an axe. But trapped in the midst of betrayals, political intrigue and forces that seek to decimate him, will he be able to follow his destiny before the Kaliyug begins? After a defeat at the hands of Lord Kali, Kalki Hari must journey towards the Mahendragiri mountains with his companions to finally become the avatar he is destined to be. But the road ahead is not without peril . . .
Not only is he trapped by the cannibalistic armies of the Pisach, he is also embroiled in the civil war of the Vanars. And in midst of all this, he meets a face from the legends. Meanwhile, Manasa, the sister of the late Vasuki, plots to overthrow Lord Kali by bringing a massive war to his kingdom. But Naagpuri, her homeland, has been infiltrated by their sworn enemy, the Suparns. Not only does she need to protect her kingdom from the Suparns, she must also protect her close ones from the league of conspirators at her own home. Who can she really trust? And will she be able to put an end to Lord Kali’s rule? As the plot thickens and Lord Kali sees his ambition crushed right before his eyes, he comes to know about his race and its history that threatens to destroy the very fabric of this world’s reality. Can Kalki become the avatar in time before it finally unfolds? Will Manasa fight through the internal politics to bring an invasion against Lord Kali? Can the secret that changes everything change Lord Kali as a person too? Next Post “The Blue Moon Day” – Book Review | Soulful and Inspiring..
Have you read it? is it good?